LipoSculpture is the latest European technique to enhance body curvature and skin tightening. LipoSculpture is a surgical technique to remove unwanted deposits of fat from specific areas of the body, including the face and neck, arms, trunk, abdomen, upper bra bulges, buttocks, hips and thighs, and knees, calves and ankles. This is not a substitute for weight reduction, but a method for removing localized deposits of fatty tissue that do not respond to diet or to exercise. 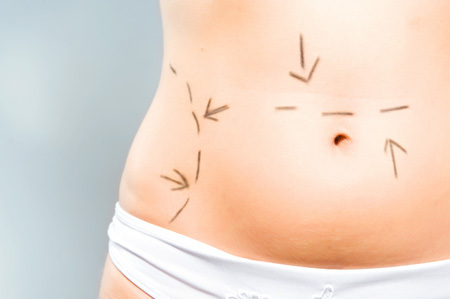 LipoSculpture may be performed as a primary procedure for body contouring or may be combined with other surgical techniques such as facelift, abdominoplasty, or thigh-lift procedures to tighten loose skin and supporting structures. A very small hollow metal surgical instrument known as a cannula is inserted into the skin and moved back and forth. The suction assisted liposuction that is performed affects the collagen in the skin which later causes the skin to tighten and shrink gradually over the next 3-6 months. An innovative technique in microcannulation, it allows maximal collagen stimulation without damaging superficial fat layer and lymphatic system and with less trauma to the surrounding tissue. The result is dramatic skin tightening without skin irregularities and dimpling, skin discoloration, swelling and bruising that are common with the larger more aggressive traditional liposuction cannula. LipoSculpture is performed under local anesthesia. The tumescent liposuction technique involves the infiltration of fluid containing dilute local anesthetic and epinephrine into areas of fatty deposits. This technique can reduce discomfort at the time of surgery as well as reduce postoperative bruising. Support garments and dressings are worn to control swelling and promote healing. How do I know if I am a candidate for LIpoSculpture? LipoSculpture is not a quick way to lose weight or an alterative to a healthy diet and exercise program. Excellent candidates are individuals of relatively normal weight who have areas of excess fat that will not respond to diet and exercise. Hanging skin will not reshape itself to the new contours and may require additional surgical techniques to remove and tighten excess skin. Where can LipoSculpture be done? LipoSculpture works well on any part of the body with unwanted fat, such as face and neck (double chin and jowling), sagging upper arms, abdomen, hips (love handles), thighs (saddle bags), buttocks (banana rolls), bra bulges, knees, calves and ankles. Every surgical procedure involves a certain amount of risk. It is important that you understand the risks involved with LipoSculpture. An individual’s choice to undergo a surgical procedure is based on the comparison of the risk to potential benefit. Although the majority of patients do not experience these complications, you should discuss each of them with your SkinRenew physician to make sure that you understand the risks, potential complications, and consequences of liposuction. What can I expect directly following the procedure? While the purpose of your surgery is to improve appearance, the healing process needs to be understood. Before the planned results are achieved there is an initial period of swelling and bruising. You may feel sore and achy. The area of the surgery may feel numb. Most bruising and swelling subsides substantially after one week, but it is not unusual to see resolution taking 2-4 weeks or longer. You will continue to see results up to 6 months following the procedure. The fat cells that are removed by LipoSculpture do not grow back. If the patient later gains or loses weight, the change tends to be distributed proportionately over the entire body. Although one can expect some changes with aging, provided that the patient does not gain large amounts of weight, the new, more pleasing silhouette is relatively permanent.